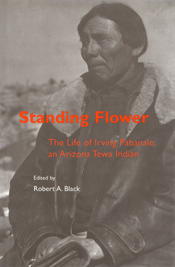 Standing Flower—Irving Pabanale's Tewa name—was born in the latter part of the nineteenth century into a rich and unique heritage. Around 1700 his Tewa ancestors migrated from the Rio Grande to the Hopi community of First Mesa. They came at the invitation of the Hopi to serve as warrior-protectors against marauding Utes, a relocation exceptional in the history of the Pueblo southwest. Not only did the Arizona Tewa fulfill their military and later police duties, eventually a number of them served as brokers or intermediaries between Hispanic and Anglo culture on the one hand and Hopi culture on the other, through it all preserving their language and much of their Rio Grande way of life. Irving Pabanale was no exception, working on the tribal police force, serving as a judge, and then becoming a medicine man. Toward the end of his life, between 1966 and 1969, he recorded a series of reminiscences and folktales in consultation with Robert Black. In this volume, Black has compiled these episodes, adding relevant historical and anthropological commentary. This is a unique chronicle of the life of culture broker who witnessed the great changes that took place in Hopiland during the early and middle years of the twentieth century. Robert Black is emeritus professor of anthropology at the University of California at Berkeley.